By Keith Cowing on November 28, 2013 7:32 PM. "Comet ISON went around the sun on Nov. 28, 2013. Several solar observatories watched the comet throughout this closest approach to the sun, known as perihelion. While the fate of the comet is not yet established, it is likely that it did not survive the trip." By Keith Cowing on November 28, 2013 7:02 PM. Keith's note: The launch of SES 8 by SpaceX was called off after two attempts to launch tonight. Both countdowns got down to within seconds of a launch. The Falcon 9 is likely to be taken down, brought to the hangar, and inspected before the next attempt. There is a window available at the same time tomorrow evening but it sounds like this inspection process will take several days. By Keith Cowing on November 25, 2013 6:02 PM. 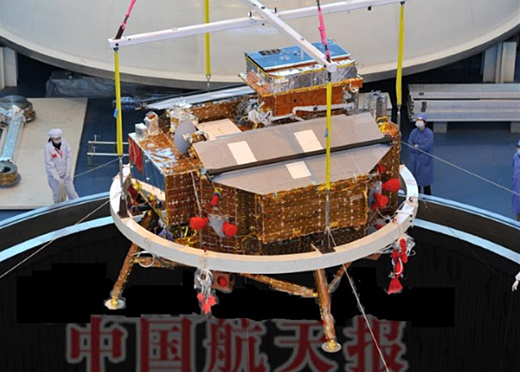 Keith's note: Have a look at "The Lunar Orbiter Meteoroid Experiments -Description and Results from Five Spacecraft" online at Infoeach - in China. China has their own version of NTRS - just in case NASA shuts it down again to check and see if China is getting access that it should not have. This paper was not available on NTRS to Americans for months even though it deals with spacecraft that flew in the 1960s. Feel safer now? By Keith Cowing on November 25, 2013 5:45 PM. "The Russian Progress 53 cargo craft blasted off from the Baikonur Cosmodrome in Kazakhstan on Nov. 25, hauling almost three tons of food, fuel, supplies and holiday gifts to the International Space Station's Expedition 38 crew. The unpiloted spacecraft will test upgraded automated rendezvous equipment at a distance of a mile from the complex on Nov. 27 before docking to the aft port of the Zvezda Service Module on Nov. 29." Continue reading Old Space / New Space: Its Just Name Calling. By Keith Cowing on November 22, 2013 2:01 PM. Keith's update: This court document (actually it is two documents) contains the details of what Ed Mango's case is all about including his plea agreement. "After stepping down last month as the head of NASAs Commercial Crew Program, Ed Mango has pleaded guilty to a federal felony charge that he improperly intervened to help a colleague to whom he had loaned money. 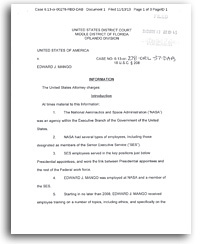 Mango loaned undisclosed amounts starting in October 2012 to the colleague identified in court records as C.T. including funds to hire a lawyer after her arrest last December, according to a plea agreement signed Nov. 13 and filed this week in the U.S. District Court in Orlando." "Court records identify the employee as a single mother with the initials "C.T.," and in one instance as "Thomas." FLORIDA TODAY reported last December that Candrea Thomas, a NASA public affairs officer who served as a spokeswoman for the Commercial Crew Program and worked closely with Mango, was arrested at her office at the KSC Press Site on felony charges of forging public records. NASA confirmed that Thomas was the only employee who performed work with the Commercial Crew Program who was arrested at KSC that month." "A NASA employee, who works at Kennedy Space Center, was arrested on forgery charges on Thursday 38-year-old Candrea Thomas, an employee in the Public Affairs department at the Kennedy Space Center, has been booked into the Brevard County jail, according to Brevard County Sheriff's Office." By Keith Cowing on November 21, 2013 2:36 PM. "The United States has long been a leader in space, and President Obama remains committed to maintaining America's competitiveness in the aerospace sector. The National Space Transportation Policy the President signed today will ensure that the United States stays on the cutting edge by maintaining space transportation capabilities that are innovative, reliable, efficient, competitive, and affordable, and that support U.S. interests." By Keith Cowing on November 20, 2013 11:01 PM. "NASA has had conversations with Inspiration Mars to learn about their efforts and will continue discussions with them to see how the agency might collaborate on mutually-beneficial activities that could complement NASA's human spaceflight, space technology and Mars exploration plans. Inspiration Mars' proposed schedule is a significant challenge due to life support systems, space radiation response, habitats, and the human psychology of being in a small spacecraft for over 500 days. The agency is willing to share technical and programmatic expertise with Inspiration Mars, but is unable to commit to sharing expenses with them. However, we remain open to further collaboration as their proposal and plans for a later mission develop." "Tito initially envisioned the flyby as an effort primarily backed by private contributions, but the 90-day study determined that the mission had to be done with NASA hardware. "This is really a NASA mission," Taber MacCallum, Inspiration Mars' chief technology officer, told NBC News. "This is a mission we believe NASA should do." "Are you suggesting that the mission couldn't be undertaken without additional NASA funding?" asked Rep. Donna Edwards (D-MD), ranking member of the space subcommittee. 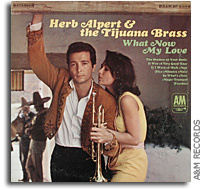 "Right now, I don't see a lot of evidence that money is available," Tito responded." Keith's note: In a media interview today Dennis Tito and Taber MacCallum said that they viewed the Inspiration Mars mission as a "NASA mission" and that Congress and the White House would need to direct NASA to do this mission as part of their SLS program. Tito also said that there would be legislation submitted on their behalf soon but declined to say who the sponsor was. Tito and MacCallum also said that they had briefed the White House on the Inspiration Mars concept and that the White House was supportive. Administration sources contacted tonight note that it has been many months since Inspiration Mars briefed them and that the mission that they were briefed on was a wholly private venture that did not require NASA funds - certainly not a "NASA Mission". Administration sources add that it would be incorrect to state that Administration supports the Inspiration Mars mission as a "NASA mission" requiring NASA funds or hardware. By Keith Cowing on November 20, 2013 10:40 AM. By Keith Cowing on November 19, 2013 12:14 AM. "This option would terminate NASA's human space exploration and space operations programs, except for those necessary to meet space communications needs (such as communication with the Hubble Space Telescope). The agency's science and aeronautics programs and robotic space missions would continue. Eliminating those human space programs would save $73 billion between 2015 and 2023, the Congressional Budget Office estimates." "China is positioning itself to provide orbital laboratory space, experiment racks and facilities to scientists worldwide following the completion of the U.S.-led international space station program. "China Space Station (CSS) will operate in orbit from 2022 to 2032. This period will provide much more opportunities to scientists in China and all of the world after the international space station," Gu Yidong, president of the China Society of Space Research, said at the American Society for Gravitational and Space Research conference here Nov. 3 - 8." Keith's note: NASA cannot fully develop and operate SLS - and extend ISS beyond 2020. There is simply not enough money to do both. But viable commercial alternatives and architectures abound. Watch as JSC squares off against MSFC and KSC and their respective congressional delegations. Meanwhile Russia is talking about a post-ISS world and China wants to create their own ISS - including the whole "international" bit. NASA took a generation and $80-100 billion to create ISS only to throw it away before it achieves its fullest potential? Crazy you say? We walked away from Apollo. NASA, Congress, and the White House are creatures of habit. "Given that the funds are simply not going to be available to keep the ISS alive and functioning and to fully construct and operate the SLS/Orion system, something has to give. Are we going to have to kill one to insure the other's survival? That is the choice that that is presenting itself - a clear recipe for disaster as far as NASA's human space flight plans are concerned." By Keith Cowing on November 17, 2013 5:01 PM. "Four meetings in Washington, D.C. over this past week addressed the future of space exploration, but no unified message emerged. There was a focus on the role of the entrepreneurial NewSpace private sector and public-private partnerships, but also on the traditional model of government contracting with major aerospace companies. Integrating what all of the prominent individuals involved in these events wanted the public and policymakers to hear is challenging. That is not to imply that the organizers - a potpourri of government and non-government institutions -- intended there to be an integrated message from four separate events, but in an era when a cohesive rationale for and approach to space exploration is needed, such an outcome would have been helpful. Instead, it was more of a scattershot experience. Four events featuring a variety of new and established players arguing in favor of space exploration from various viewpoints. Here's a quick rundown." NASA's Communications Plan: Making It Up As They Go? By Keith Cowing on November 17, 2013 1:51 PM. Keith's note: Toward the end of this morning's Maven press briefing, a reporter from the Travel Channel asked if NASA has any plan for marketing itself to the public so as to enhance visibility, increase funding, and that reaching out to the public is NASA's biggest challenge and greatest opportunity. NASA SMD AA John Grunsfeld (@SciAstro) replied that NASA does not have such a plan but instead that the agency puts spectacular missions into operate and educates the public about them. Well, "education" is not the same as "marketing". NASA is holding a "NASASocial" in connection with the Maven launch. Alas, except for one NASA Social participant who asked a rather good question, virtually none of the NASASocial participants on-site at KSC (or their alumni elsewhere) bothered to tweet about the press event. Yet when NASA pays attention to the NASASocial people they brag about getting better access to things than the media, the swag NASA gives them, and chatter about what is said in their sessions. NASA keeps doing these socials - so they deserve credit for that - but I am not certain what they accomplish when all is said and done. Being a "Trending Topic" on Twitter only lasts while people are actually Tweeting and it only has an effect while people are awake or able to read Tweets. I have to agree with the Travel Channel guy's query. Does NASA have a marketing plan? I see no evidence that they do. Yes, there is some scary language in some congressional legislation that prohibits NASA from lobbying but there is also equally compelling and binding congressional language that prompts NASA to better communicate with the public. I have the clear impression that NASA finds it vastly easier to say "no" than to try and push the envelope. 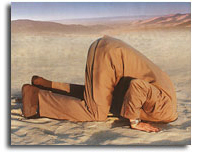 There are a lot of people at NASA who try but there seem to be even more who thwart them or simply sit on their hands. Is Roscosmos Spying on Americans Or Not So Much? By Keith Cowing on November 17, 2013 1:19 AM. "In recent months, the Central Intelligence Agency and the Pentagon have been quietly waging a campaign to stop the State Department from allowing Roscosmos, the Russian space agency, to build about half a dozen of these structures, known as monitor stations, on United States soil, several American officials said. They fear that these structures could help Russia spy on the United States and improve the precision of Russian weaponry, the officials said. These monitor stations, the Russians contend, would significantly improve the accuracy and reliability of Moscow's version of the Global Positioning System, the American satellite network that steers guided missiles to their targets and thirsty smartphone users to the nearest Starbucks." By Keith Cowing on November 14, 2013 10:41 AM. "By spreading its funds across the country, and having 10 field centers, NASA can count on a broad political base. But by having so many fiefdoms (the NASA centers), and feeling compelled to spread contracts across the country, the space agency ends up being horribly inefficient and accomplishing significantly less than it could. I'm not sure there's the political will to fix a problem that's been evident for four decades any time soon." By Keith Cowing on November 11, 2013 3:30 PM. "Two years ago, XPRIZE began a dialogue with teams to better understand the challenges that they were facing and to determine what steps we might take to better nurture and support this prize ecosystem. As a result, we determined that we needed to find a way to recognize and support the teams that were making substantial technical progress toward the requirements of the competition." Keith's note: All of the Google Lunar X Prize competitors really need money. By creating these smaller prizes that are easier to achieve, the competitors have a chance to get some much-needed funding to keep their doors open. Of course, if Chang'e 3 lands on the Moon and deploys its rover, the Google Lunar X Prize automatically reduces by a significant amount. Add in the fact that none of the GLXP competitors have exhibited actual flight hardware or raised the funds to build and launch their vehicles and the chances for pulling this off by the December 2015 deadline are really starting to fade. This effort tosses some cash their way but also allows GLXP to proclaim "winners". Whether this will actually improve the odds that the teams launch anything remains to be seen. Keith's update: The rules used to say "The competition's grand prize is worth $20 million. To provide an extra incentive for teams to work quickly, the grand prize value will change to $15 million whenever a government-funded mission successfully explores the lunar surface, currently projected to occur in 2013." Well, the prize decrease that would have resulted from a government-funded mission (e.g. Chang'e 3) has been removed. You can read the new rules here. Clearly the Google Lunar X Prize is quietly trying to get money to some of their teams much more easily - and sooner - and they are moving (or removing) the older goal posts so as to make it easier for teams to win these smaller prizes. By Keith Cowing on November 11, 2013 3:27 PM. "The planetary research and analysis programs, along with mission data analysis programs, support most of the US planetary community. Their streamlining could provide benefits. A misstep could permanently damage US solar system exploration capability. The plan laid out is very vague. Its implementation is premature. So, it is very good that NASA is reaching out to the community for input. This should be the first step in a more extended process that will transparently and iteratively add important details and well-defined improvements to any reorganization plan. It is far more important to get it right, than to rush and cause harm." By Keith Cowing on November 10, 2013 10:01 PM. "Three Expedition 37 crew members are back on Earth after 166 days aboard the International Space Station. Soyuz Commander Fyodor Yurchikhin and Flight Engineers Karen Nyberg and Luca Parmitano undocked their Soyuz TMA-09M spacecraft from aft end the Zvezda service module at 6:26 p.m. EST Sunday to begin the journey home. At the time of the undocking, the complex was orbiting 262 miles over northeast Mongolia." By Keith Cowing on November 8, 2013 11:43 AM. By Keith Cowing on November 7, 2013 9:41 AM. "NASA astronaut Rick Mastracchio, Japan Aerospace Exploration Agency astronaut Koichi Wakata and Soyuz Commander Mikhail Tyurin of Roscosmos launched aboard their Soyuz TMA-11M spacecraft from the Baikonur Cosmodrome at 11:14 p.m. EST (10:14 a.m. Thursday, Kazakh time)." Keith's update: Soyuz TMA-11M docked with the space station about six hours after launch at 5:31 a.m. Thursday, Nov. 7. By Keith Cowing on November 6, 2013 7:19 PM. "A team of NASA and international scientists for the first time have gathered a detailed understanding of the effects on Earth from a small asteroid impact. The unprecedented data obtained as the result of the airburst of a meteoroid over the Russian city of Chelyabinsk on Feb. 15, has revolutionized scientists' understanding of this natural phenomenon." "Existing models predict events like the Chelyabinsk asteroid might hit every 120 or 150 years, but our data shows the frequency may be closer to every 30 or 40 years," explains Brown, the Canada Research Chair in Meteor Science, who also serves as CPSX Director. "That's a big surprise. When Chelyabinsk happened, I would have never expected to see an event big enough to cause damage on the ground. It's totally outside the realm of what we thought likely in our lifetimes based on earlier statistics. Our statistics now suggest this type of event likely happens with more frequency." By Keith Cowing on November 6, 2013 2:04 PM. Keith's note: It would seem that Lady Gaga was on the YouTube music awards last night and was behaving oddly (even for her). If you watch the video of her performance you can clearly see that she is wearing a baseball cap with a NASA "meatball" logo on it - except instead of "N-A-S-A" it spells out "D-O-P-E". I have no idea if this means anything. But she does sell millions of records. "No one ever said she was down-to-earth! In early 2015, Lady Gaga will become the first artist to sing in outer space, Us Weekly can exclusively reveal. The "Dope" performer, 27, is set to blast off in a Virgin Galactic ship and belt out a single track during the Zero G Colony high-tech musical festival in New Mexico." Keith's update: I guess Gaga missed Chris Hadfield's performance in space earlier this year. By Keith Cowing on November 6, 2013 1:08 PM. 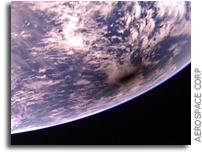 "One of Aerospace's CubeSats captured a photo of the moon's shadow on Earth's surface during the solar eclipse that occurred on Nov. 3. This solar eclipse began at 11 a.m. UTC and lasted for about two hours, with the shadow of the moon tracing a thin path that began in the Atlantic near Bermuda, crossed the ocean in a southeasterly direction, and ended over central Africa." By Keith Cowing on November 6, 2013 12:32 PM. "NASA has selected nine research teams from seven states for a new institute that will bring researchers together in a collaborative virtual setting to focus on questions concerning space science and human space exploration. The teams participating in the Solar System Exploration Research Virtual Institute (SSERVI) will address scientific questions about the moon, near-Earth asteroids, the Martian moons Phobos and Deimos, and their near space environments, in cooperation with international partners." By Keith Cowing on November 6, 2013 8:18 AM. "NASA Astrophysics Division Director Paul Hertz painted a bleak picture of NASA's FY2014 astrophysics budget today and forecast a future filled with uncertainty. The James Webb Space Telescope (JWST) may be secure, but the rest of NASA's astrophysics program could have tough sailing ahead. Hertz stressed that the country spends quite a bit of money on NASA's astrophysics portfolio - a total of $1.3 billion "and you can't plead poverty when there's $1.3 billion on the table." Roughly half of that is for JWST, however, which is managed separately from the rest of NASA's astrophysics programs." By Keith Cowing on November 5, 2013 8:58 PM. "We find that 22% of Sun-like stars harbor Earth-size planets orbiting in their habitable zones. The nearest such planet may be within 12 light-years." "The research was funded by UC Berkeley and the National Science Foundation, with the assistance of the Keck Observatories and NASA." "This whole situation is even more absurd, because US copyright law explicitly says that all works of the federal government - of which these surely must be included - are not subject to copyright. So, in the interests of helping NASA and Science Magazine comply with US law, I am making copies of these papers freely available here"
Keith's 5 Nov update: PNAS has finally made this paper available to the public free of charge. Its just baffling how NASA is unable to coordinate this sort of thing in advance rather than after the fact. 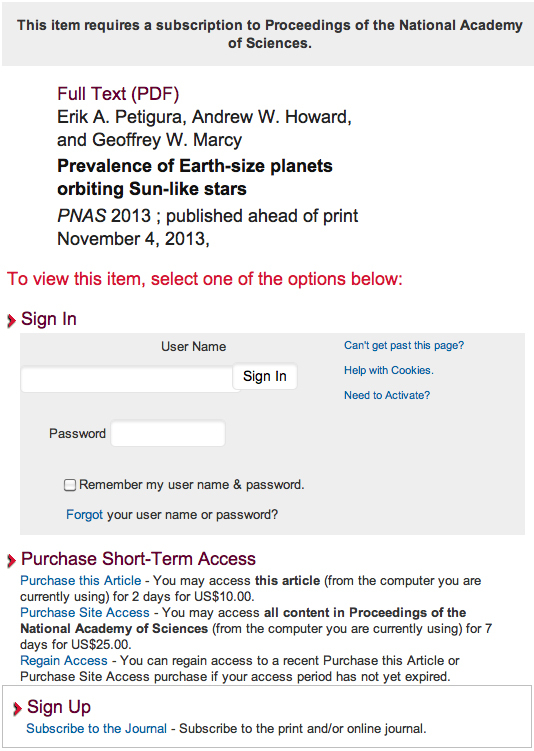 Now, will NASA make a point of letting people know that this paper is online? 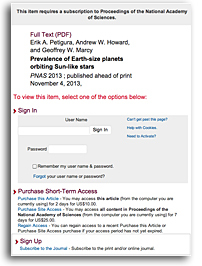 Continue reading You Can't Read About Billions of Habitable Zone Planets Unless You Pay (Update). By Keith Cowing on November 4, 2013 10:00 PM. "So check out the Milky Way next time you're outside the glare of city lights, and ruminate on the thought that at least 33 billion habitable planets are somewhere up there. But that's just the local population. We can't see the entire universe, but the fraction we can see is studded with roughly 150 billion other galaxies; each with its own complement of habitable worlds. So the number of life-friendly planets that are currently in the part of the cosmos we can possibly observe is five thousand billion billion. That's a big number. It's bigger than the number of cells in all the people of Earth." 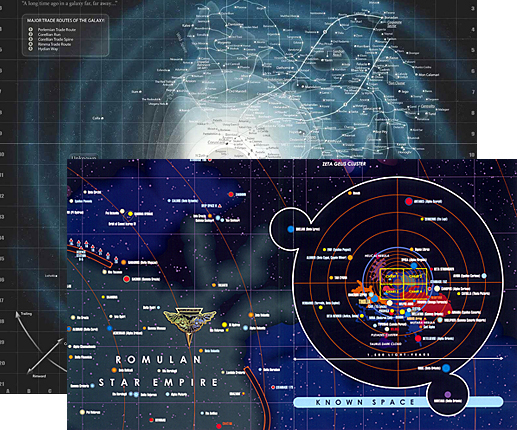 Keith's note: Think about it: these maps from the Star Wars and Star Trek Universes are now usable as illustrations of Kepler data. This is stunning news. What is baffling is how Ames PAO totally botched the release of this news - and the underwelming press release that NASA put out. This one discovery makes everything that Star Trek, Star Wars, and every other imagined universe envsioned now seem totally plausible. In some ways (read Seth's entire piece) it almost makes many of these fictional universes far more probable today than they were this morning before the news burst out on Twitter. There are now just so many damn planets out there that almost anything is possible. Yet NASA itself seems to be sound asleep when it comes to the profound ramifications of this news. Indeed, it looks like NASA really doesn't care. By Keith Cowing on November 4, 2013 3:31 PM. Keith's 2:30 pm EST note: NASA Ames PAO just hosted a media briefing on new Kepler news being released today i.e. "22±8 % of the Sun-like stars have an Earth-like planet"' (per Tweet below). One small problem, they did not set the number of guests who could connect via on Adobe Connect so a lot of media were unable to connect untill well after the media briefing was underway. But the news was already being tweeted by participants (an hour ago) in that news briefing. When I asked NASA ARC PAO for a copy of the press release they refused to send me anything saying that NASA HQ PAO will be releasing the news at 3:00 pm EST. Meanwhile NASA has been sending copies of the paper around to hand-picked members of the news media. So ... NASA holds a badly-planned news conference and whoever attends (or logs in early) can release the news to the public but NASA won't let anyone else see the news that they have already released. Baffling strategy. By Keith Cowing on November 2, 2013 11:37 AM. Reader note: "Alan Hochstein, longtime Shuttle Approach & Landing expert passed away today. He may not have been a major figure like Kraft, et. Al. But ask the astronauts about Hochstein. They had a very healthy respect for his critiques. Wayne Hale refers to him in his blog." Alan Worked for Rockwell International and received a Silver Snoopy in 1992. "Alan was the senior landing analyst. That means he studied more and worked harder than anyone to understand how the shuttle flies - especially in the final approach and landing phase. One part of Alan's job was to analyze the telemetry from each shuttle landing and see how that compared to the "ideal" landing. So in a quiet office environment over a couple of weeks, Alan and his team would look at each telemetry point, every sample (up to 125 per second for some parameters) and compute how each one affected the landing." By Keith Cowing on November 1, 2013 9:18 PM. "Astronauts Buzz Aldrin of Apollo 11 and Eugene Cernan of Apollo 17 tell Aerospace America that engineering details emerging from China's first robotic Moon lander suggest it is a formal precursor to a manned lunar module that would carry Chinese astronauts to the surface of the Moon around 2030. 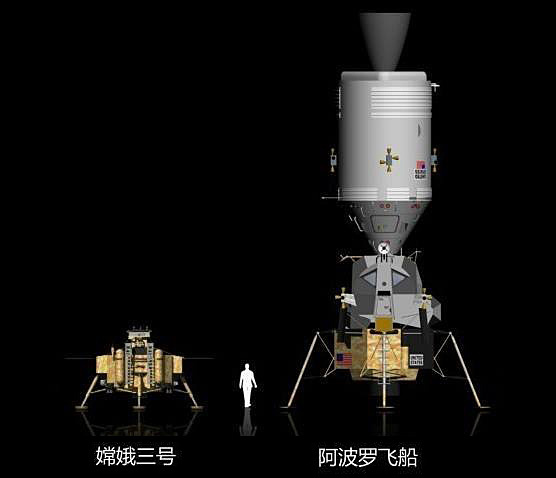 In their view, the time may be right for NASA to begin direct cooperation with China on the return of humans--both Chinese and American--to the Moon as a prelude to international manned missions to Mars." By Keith Cowing on November 1, 2013 4:26 PM. "NASA Kennedy Space Center (KSC) plans to issue a Request for Proposal (RFP) to compete requirements for Commercial Crew Transportation Capability (CCtCap) Phase 2 of the Commercial Crew Program. The CCtCap contract is the second phase of a two-phased procurement strategy to develop a U.S. commercial crew space transportation capability to achieve safe, reliable and cost effective access to and from the International Space Station (ISS) with a goal of no later than 2017." Can A Hit Movie Translate Into Support for NASA? By Keith Cowing on November 1, 2013 9:56 AM. "Despite the popularity of films like "Gravity," public interest in NASA and space travel appears to be in hibernation. Although movie crews are inventing new technology to explore space on the big screen, Americans' real-life space program continues to languish. With an estimated budget of $100 million, a multi-year production schedule (it took four and a half years to complete), and minimal interference from Warner Bros., the making of "Gravity" serves as something of a microcosm for what it takes to explore space in the real world: vision, commitment, and a lot of financial backing." Keith's note: It certainly would be nice if there was a boost from the public after seeing "Gravity" for NASA funding. But is giving NASA more money the only option? Private sector initiatives are becoming more bold and commercial options are increasingly capable.